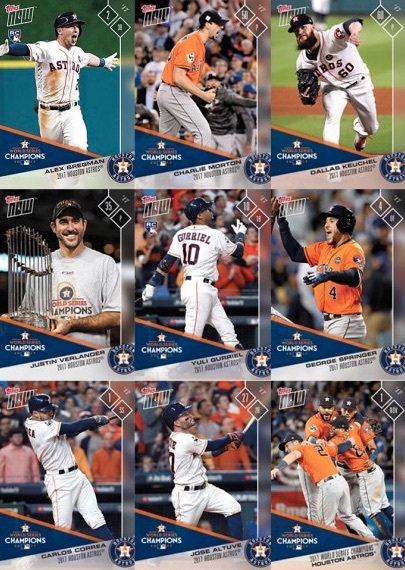 The hard part is over and now fans can celebrate with the 2017 Topps Now Houston Astros World Series Champions team sets. Sold for several weeks following the Game 7 victory, collectors can pick from a trio of choices exclusive to the Topps online store. With a thrilling World Series win over the Los Angeles Dodgers in seven games, the Houston Astros claimed their first title in franchise history. 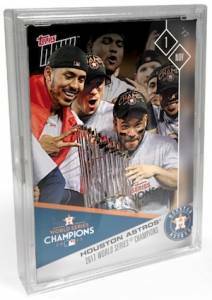 Soon after came the 2017 Topps Now Houston Astros World Series Champions team set. Featuring images from the series, there are three different formats in play. Basic and inexpensive, the main Team Set comes with nine cards for $24.99, while the Collector's Edition ups that amount to a 20-card set for $49.99. It is important to note that the Collector's Edition has different images from the Team Set. Shop 2017 Topps Now Astros World Series cards on Topps. The most expensive and limited option, 2017 Topps Now Houston Astros World Series Champions Autograph Edition packs all 20 cards from the Collector's Edition and offers an autograph. Priced at $99.99, these sets will go the quickest since they guarantee a signed card with a print run of 99 or less from a select group of signers including Alex Bregman, Carlos Correa and Jose Altuve. The 2017 Topps Now Houston Astros World Series Champions sets are on sale direct from Topps. Sales continue for 45 days for the nine-card set (ending December 17), and 22 days for the 20-card set (ending November 24). While on the same schedule as the Collector's Edition, the Autograph Edition supplies are limited and can sell out prior to November 24. As many collectors know, these are not the only ways to revisit the Houston Astro's run to the title. In addition to many Astros cards in the main 2017 Topps Now Baseball set, there are also options in 2017 Topps Now Postseason and 2017 Topps Now World Series Matchups. Not just limited to cards, plenty of Houston Astros World Series memorabilia and apparel is also available. 9 or 20 cards per set. Shop for Astros Now WS sets on Topps. Full checklists will be added. Images are different for each set. Final Print Run is 4,294 sets. Confirmed names listed below. Only found in Autograph Edition set. 1 card per set. Buy the 2017 Astros Now WS Autograph sets on Topps. Card Versions: #/99, #/49, #/25, #/10, #/5, 1/1.